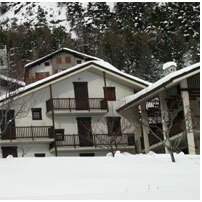 Saint-Nicolas is a mountain municipality, situated on one of the most characteristic lateral terraces of the Aosta Valley. It comprises villages at an altitude of between 1,000 and 1,800 mt. Saint-Nicolas has a dry, salutary climate and a very sunny position in midst of a delightful scenery of woods and pine-forest, one of these, the "Bois de la Tour", is fitted out as a picnic area. It is a particulary apt place for a holiday devoted to fortifying body and mind in a re-discovered contact between man and nature. 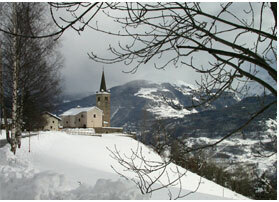 The town's natural symbol is the bell tower of the historical church facing an evocative view-point overlooking the central valley, the Emilius, the Grivola, the Ruitor glacier and the mouths to the Valley of Cogne, Valsavarenche, Rhêmes and Valgrisenche, to next National Park "Gran Paradiso".. The resort offers the possibility to plan walks and hikes for everyone. The Vertosan Valley, branching off from the Col Citrin, encloses uncontaminated scenery such as the lakes of Zioule and Leysser. The area of Vetan (Saint-Pierre) with Mount Falère, the Freney waterfalls (Avise), the caracteristic, rare gulleys are some of the most evocative itineraries of the Aosta Valley. 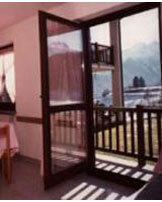 At Saint-Nicolas there are facilities such as tennis courts, bowls and a children's playground. For winter sports enthusiasts there is a 10 km. long crosscountry skiing track, which can also be used for competitive events. A 3 km. li-up night ring enables skiing in the evening hours. There is a ski-lift for downhill skiing, whilst the numerous snow-covered open spaces afford hours of sledging fun for the children. The areas forming an evocative corollary around the town (Vertosan, Vetan, Mont Falère, Col Citrin) are the destination of many itineraries.